Party Animals! They’re always trying to act like humans, celebrating the New Year or camping, for instance. And somehow, it always involves beer. What audacious little, beer-lovin’ critters! Australia, in particular, became famous in the 1980’s for a beer-guzzling Brahman Bull named Norman. 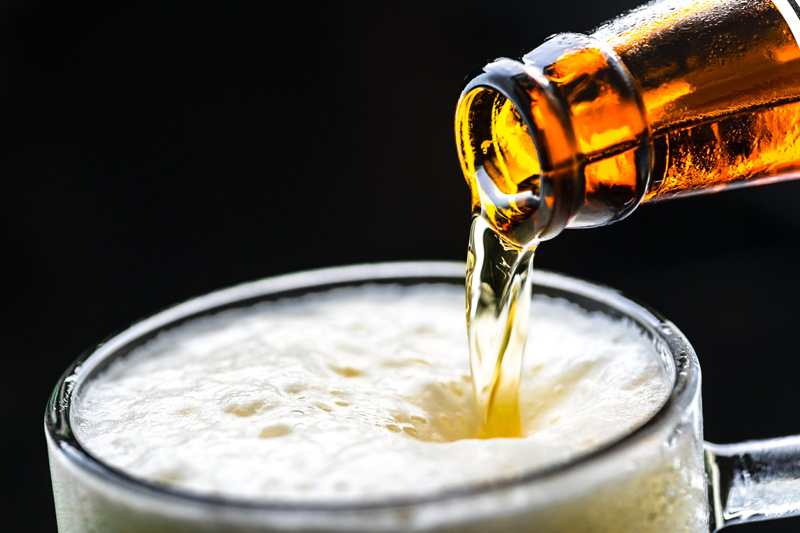 It seems he downed a 2-litre Darwin Stubby, a pale lager brewed by Blue Tongue Brewery, in 44 seconds at the Humpty Doo Hotel outside of Darwin in New South Wales. The Schlitz Malt Liquor slogan, “Nobody does it like the BULL!” takes on a whole new meaning when you consider Norman’s taste for lager-style beer. In 1986, you may recall the champion Kiwi racehorse, “Bonecrusher.” In an unforgettable heart-stopper, this world-class beauty pounded the pavement against “Our Waverley Star” to win the WS Cox Plate, the measuring stick of quality for Australian Champion Thoroughbreds. It seems that the secret ingredient in “Bonecrusher’s” diet was the occasional Guinness Stout mixed in with his special racing diet. Pigs have beer diets, too. Nestled in one of the most beautiful valleys in Northeast Tasmania is The Pub in the Paddock at Pyengana. Amidst the lush farmland and hospitality of a bygone era lives a resident pig named “Slops,” a well-nourished little bacon-buddy who feeds on stubbies of recycled beer. The Mt. Pellier Hut & Domino Club on St. Croix boasts its own side of bacon with Toni, the Beer Drinking Pig. Toni only drinks non-alcoholic beer. If he plans it right, he may be able to attend the Pig’s Ear Beer Festival in Greater London, England next December, where he can sample more outstanding brews like Pig’s Eye Lean Light or Pig’s Eye Pilsner. In August 2004, a motley mix of campers settled in at the picturesque Baker Lake Resort, 80 miles northeast of Seattle, Washington. Meandering out of the woods during the night, a black bear discovered the jackpot – three-dozen cans of amber-brewed Ranier Beer! Using his very adept claws and teeth, the two-year-old party bear had the time of his life, and was found sprawled out in an open field, as the sun broke out over the mountain peaks at first light. He had tested the Budweiser, too, but left it for the better-bear-taste of Ranier. Although “Yogi” slipped back into the woods upon awakening, he was lured out by a trap of donuts and Ranier Beer – then taken to a more remote area so he could share his tale with his beer-loving, brother bears. A state-of-the-art GPS tracking system has pinpointed them on course for Bear Creek Brewery/Northwest Brewhouse & Grill in Washington state, with designs of sampling Bearly Barley Wine, Bear Creek Porter and Hibernation Winter Ale before settling in for a long winter nap. On the tropical Caribbean Island of St Kitts, bar monkeys are gearing up for the New Year celebration. These “happy hour” hoopsters hang out in the trees, descending on the beach bars as soon as a drink is left unattended. Victory Brewing in Downingtown, PA has their own Golden Monkey, a tripel Belgian ale with complex aromas of clove spice and fruit esters, with a balance of hop bitterness. 1. Bulls are done in 44 seconds. 2. Never ride a horse that has been drinking. 3. You may not understand “newfie” English. 4. Pigs at a bar may actually be real. 5. Beer in moderation can make you a champion. 6. Bears don’t need can-openers. 7. When camping, always take enough beer to share. 8. Don’t leave your drink unattended. 9. You can’t stop an animal from loving beer.